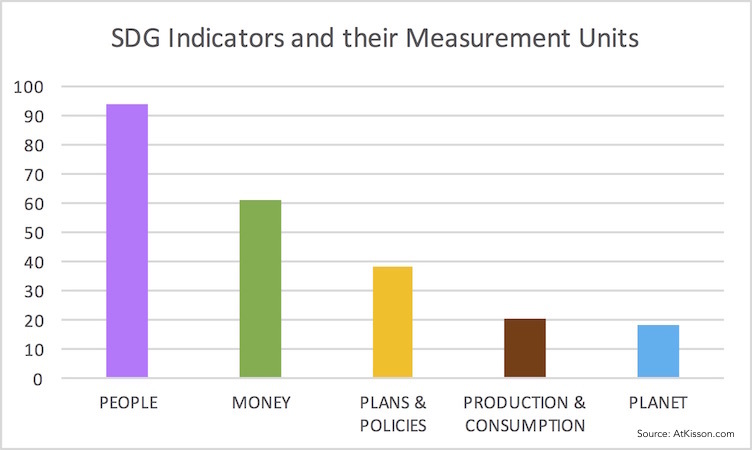 Sustainability Accelerator Network – The SDG Indicators: What are we measuring? 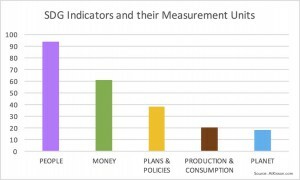 AtKisson Group has published an analysis of the newly released SDG Indicators, viewing them through the lens of “green economy,” that shows that the indicators are strongly framed in human and economic terms. Over 90 of the proposed 229 indicators are expressed in units related to “People”, such as “percentage of youth who …” or the unemployment rate (which counts people without jobs). 60 of the 229 indicators are measured in terms of “Money”. Just 18 of the indicators are direct measurements of the “Planet” in terms of natural, physical systems such as forests, species, land and water. However, 22 of the 38 indicators that were categorized by AtKisson as tests for the existence and implementation of governance processes (“Plans & Policies”), as well as 11 of 20 indicators classified as measuring material flows through the economy (“Production & Consumption”), are also focused on environment and resource issues. Seen through the lens of “green economy,” over 60 of the proposed SDG measurements are concerned with issues related to maintaining viable ecosystems and resource flows, while ensuring equitable and inclusive access to those resources. The analysis was originally created for a presentation by Alan AtKisson at an international seminar on the green economy, hosted by WWF and featuring speakers such as the Swedish Minister of Financial Markets, Per Bolund, UNEP green economy official Steven Stone, and a representative from Al Gore’s Generation Investment, Daniella Salzman. Interest in the analysis led to developing it further into a short article in the AtKisson Group’s “Blue Paper” series. 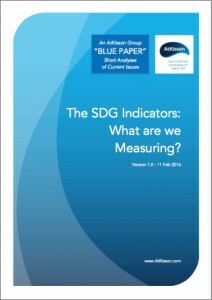 The Blue Paper, which includes the original analysis data as well as a set of recommendations for potential users of the SDG Indicators, may be downloaded free of charge below. Please note that you will be asked for your email address in order to download the paper. We promise not to misuse it. Hint: If you do not wish to give us your email address, just input a non-working address.